Hemel Hempstead in Hertfordshire has a thriving business community offering huge opportunities for companies of all sizes, from sole traders to huge international organisations. Make the most of your time by making new contacts at a wide range of business networking events in Hemel Hempstead and the surrounding area. Hemel Hempstead Business Buzz is an informal drop-in meeting held on the second Thursday of every month. It’s open to everyone, there’s no membership and you don’t even have to book – all you have to do is turn up between 10 and 12, grab yourself a coffee and start talking to people! If you’d like to be introduced to people in specific areas, ask the host to introduce you. Business Buzz is a successful networking concept with groups across Hertfordshire and Bedfordshire. Open to everyone regardless of gender or children, Mums UnLtd Hemel Hempstead is specifically aimed to help the mumpreneur’s schedule, because juggling children and a business can be tricky at times. The group meets monthly in an informal and relaxed atmosphere, and there will usually be a presentation. There are no professional restrictions and no membership, though booking is recommended. Mums UnLtd began in Hertfordshire, but is now expanding into Buckinghamshire as well as Kent. Connect Dacorum is a partnership between local businesses and the public and voluntary sectors, designed to support businesses of all sizes in the delivery of Corporate Social Responsibility. 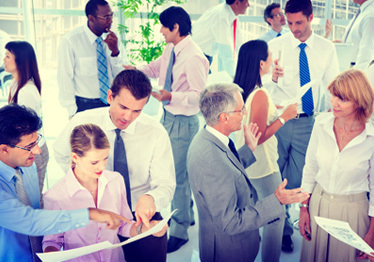 Connect Dacorum holds five business networking lunches a year which are open to non-members. As Abodebed is a member of Connect Dacorum, contact us if you would to join us at one of the lunches. Run by the Borough Council, Dacorum Look No Further supports local businesses with free advice, low cost training, skills analysis and networking opportunities. Check out the work related events on Dacorum’s calendar for details of networking and training workshops. BNI is the world’s largest networking organisation, with chapters all over the UK. It offers access to business people from all sorts of different industries, trades and professions. The idea is to learn more about each other’s business in order to seek out new business referrals for one another. It’s a closed networking group, but is always happy to welcome visitors to its breakfast networking meetings. The Hemel Hempstead chapter meets every Wednesday – if you’d like to go along as a visitor, contact the Hemel chapter’s leadership team. This nationwide networking organisation allows paid up Passport members to visit any group in the network. You can also join 4Networking for free as a member which allows you to network online and attend up to two meetings. Meetings are fun and friendly, offering three 10 minute business appointments with other attendees at every one. The Hemel Hempstead group meets for fortnightly breakfast meetings at the Watermill Hotel. The Hertfordshire Chamber of Commerce provides support and advice to all business in the county and has a busy events programme throughout the county, including networking opportunities. Abode is a member of the Chamber, so if you’re interested in joining one of the Chamber’s networking events, contact us to find out more. BBG is a local networking group which meets twice a month in Berkhamsted. The organisers believe in establishing mutually beneficial relationships to help all businesses grow. BBG’s breakfast meetings are relaxed and welcoming in order to encourage knowledge sharing and create productive working partnerships. Viva is a lunchtime membership networking group, although you can visit the group once as a visitor to decide if you’d then like to join – as Abodebed is a member, contact us for an invitation to come as a visitor. The Watford group meets once a month, and is designed to help people make contacts with other businesses for the purpose of sharing ideas, support and referrals. WIBN is a diverse membership organisation, designed to give support and encouragement to women in business. The Rickmansworth group meets once a month at lunchtimes and will always welcome new visitors. If you’re visiting Hemel Hempstead on business and are interested in renting one of our serviced apartments, with onsite parking, 15 mins walk to the station with wifi, phone and Sky TV, contact us now.